Like most holographic nail polish lovers, I was super excited to hear about the new holographic collection from China Glaze. I happy to say that I was already 'into' nail polish when the OMG collection came out, so I was able to purchase it at the release time and not spend a fortune on it. I always knew that no matter how good or bad the new Hologlam collection was going to be, I would have to get them all. As soon as they were released, I bought them. I looked at swatches online and reads lots of reviews, they all said that the holo effect was pretty poor and that this collection probably wouldn't live up to everyone hopes. Because of that, this collection of polishes sat in my untrieds for several weeks. Last week I decided to pull one of them out to see for myself how poor a cousin they really were. This is Cosmic Dust and I think its just beautiful. It's darker than your traditional silver holo, I'd say it's more a light grey. 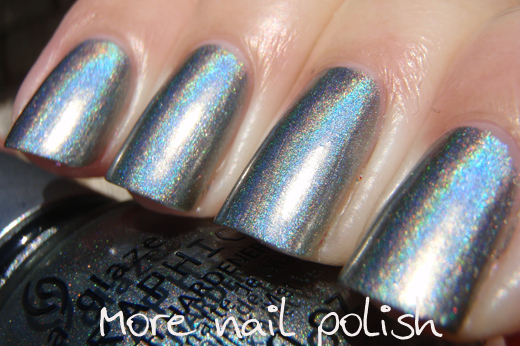 The holo particles are ultra fine and smooth and I saw a very pretty rainbow fire on my nails. This was so much better than I was expecting to see after reading all the reviews. The formula is a bit icky, just like the OMG Collection, but a quick application without going over already painted areas is the key to a good application. 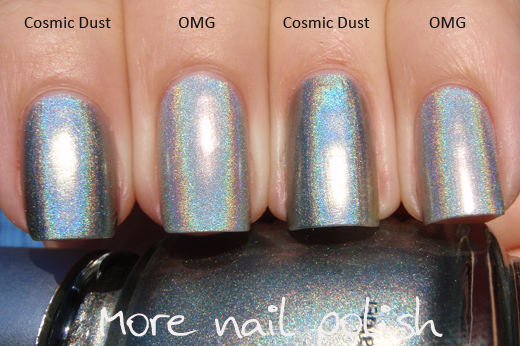 I also did a quick comparison with the original silver holo from China Glaze, OMG. 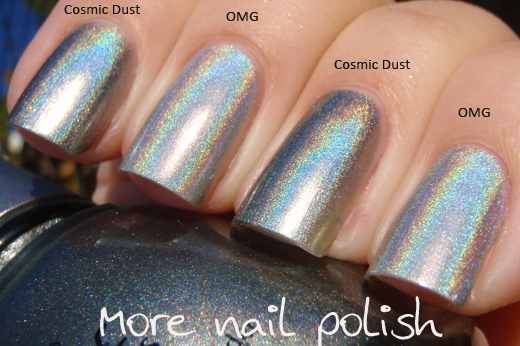 As you can see, OMG is a lighter silver and the darkness of Cosmic Dust really shows on the sides of the nails, but the holo pigment in both is actually very similar. Today I also got to catch up with fellow local nail enthusiasts. 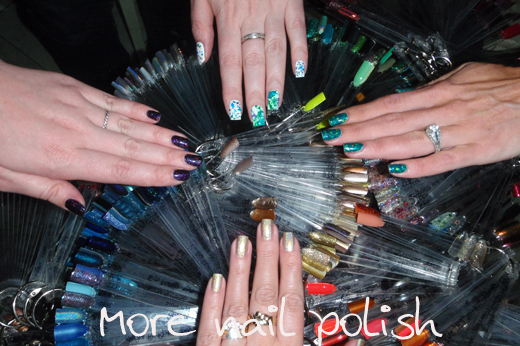 Sylvia/Lily Jinks @lilyandjinks, Hayley/Emily de Molly and Kate from Kater's Nail Blog. They came to my place and we chatted, browsed through swatch sticks, examined various helmer draws and generally had a fun nail natter! I'm looking forward to our next meetup already, thanks girls. 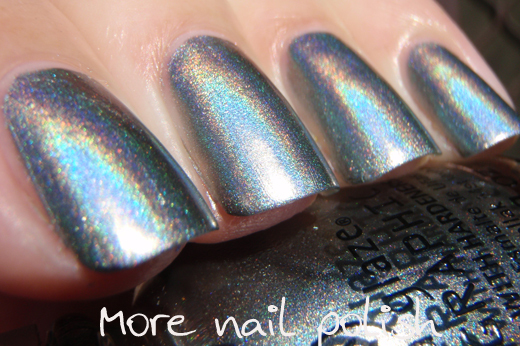 This is really pretty - it's got a bit more to it than a 'regular' silver holo! I just got three from this collection (picking out colours that aren't similar to holos I've already got (OMGs and others)) but I've been really pleased with them. Not sure I'm tempted to get the rest though, I'm trying to be firm on stash control just now! 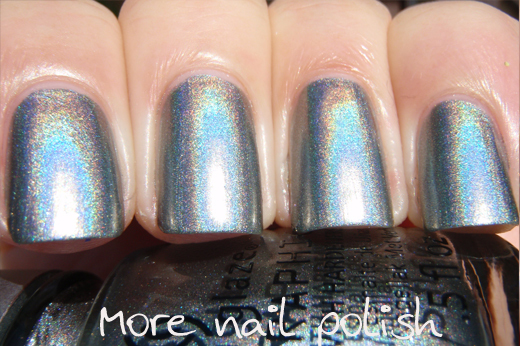 i love holos so much at this time ! Yes. Those are the quick comparison shots I took while you were all engrossed in my swatch sticks. I have them all & cosmic dust is my favorite, followed by sci fly by. Your shots are gorgeous. Really enjoy this collection.